Brother and Sister Marcel Jean are so happy to have a new roof on their home. They were praying that the Lord would help them to save enough money to get it done someday. 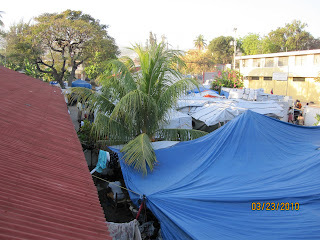 While we were visiting we saw the need and replaced the roof for them. They told me that they don't know how they could ever repay us for helping them. The pastor had tarps on his roof to help stop it from leaking. While working on the church at Thiotte we stayed in the pastors home. His roof was old and was damaged during the hurricanes. We lent him a hand and replaced his roof. Here is Pastor Marcel Jean observing the work that is being done at the church. I am in the background sitting down after a hard day of work. Kessner is helping me trowel the floor at Thiotte. The congregation is really happy to get this job done. Truckloads of rocks were needed for fill so that we could pour the church floor at Thiotte. This young girl is helping by filling a bucket and carrying it on her head and then dumping it into the bed of the truck. I was asked to participate in a funeral of a precious saint of God. Madame Tyson left behind her testimony that she certainly was a child of God. Lubens Thelisma is presented at the church. Mom and dad are dedicating him to the Lord. Lubens is like a grandson to me. The kitchen gets a pale yellow color. It is nice to get the ceilings painting and to have all the rooms painted. The living room gets a fresh coat of pale green. The master bedroom gets a coat of blue. The majority of the people are still in the yard. Here is a picture 2 months after the earthquake. 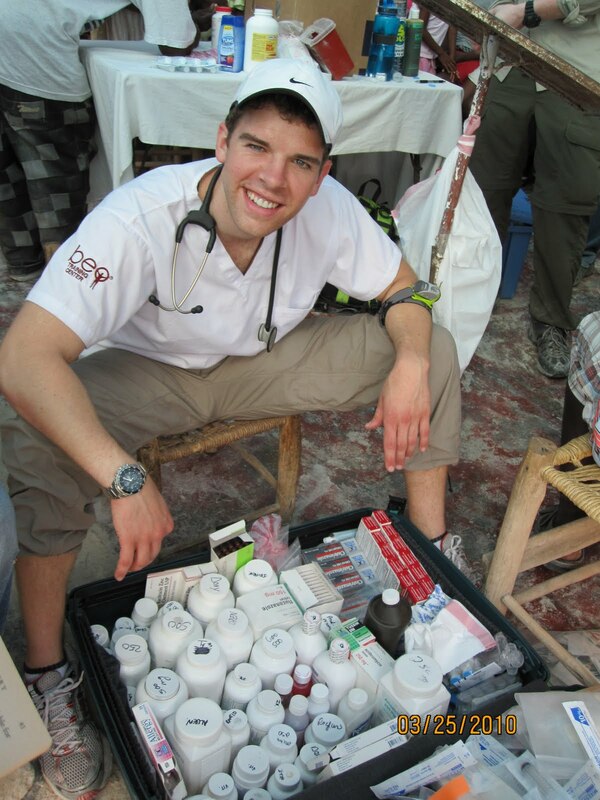 Matthew has his pharmacy in a suitcase. He packed the suitcase for the mobile clinic and is dispensing the medicines to the medical workers as they need them. 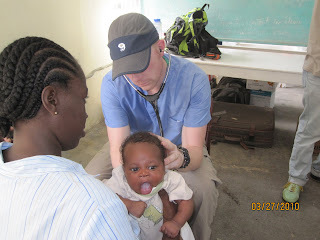 Brian and the team examined hundreds of patients daily. The team worked at the mission compound in the mornings and then went mobile in the afternoons. 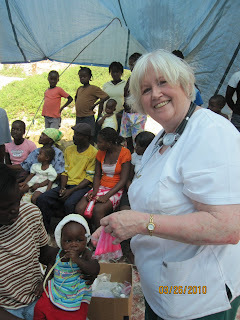 Rosemary came back for another visit to Haiti. She was on her feet from daylight to dusk as the number of patients were endless. 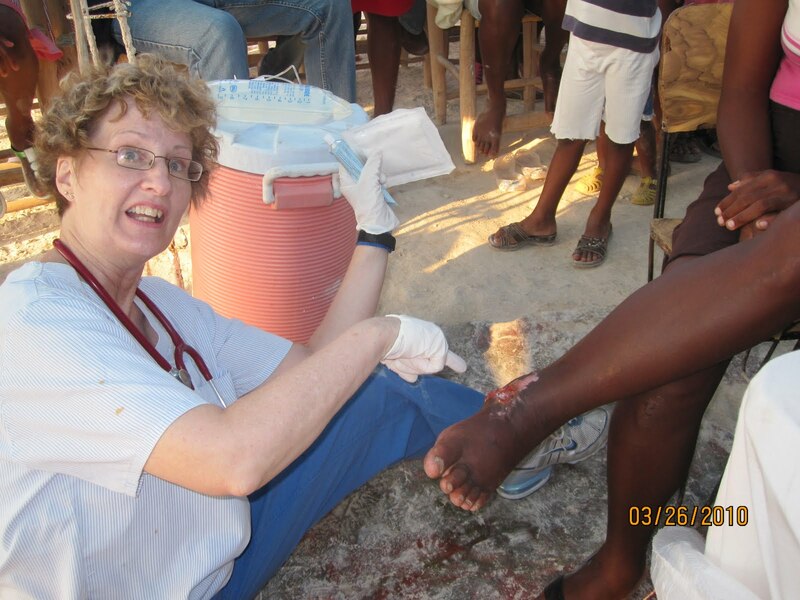 Debbie Solley returned to Haiti with another medical team in March. She carries a burden for the needs of the Haitians. Here she is bandaging a leg wound. We are working on the decorative blocks that are used to fill in the window openings. The gable end has been finished and has been plastered. Water was scarce while we were working on the Thiotte Church and a mule was used to carry water a long distance for the job. The Thiotte Church was never finished. The congregation began on their own and didn't have the funds to finish. We are helping them to get their project done. This is Fresnel and me finishing the gable ends. While several of the boy's were at home for a break I painted the room and laid ceramic tiles. It really needed some freshening up. While confined to the mission station I was able to finish some projects at the house. The boy's room was the only room that did not have ceramic tiles on the floor and we were able to lay the tiles and finish that project. A photo of the courtyard inside the fort from the roof. This is a photo from on top of the fort. You can see the numerous cannon ball arranged on the ground. I had the privilege to take a group of orpans to the Citadel. There were 19 of us that climbed the mountain to view the old fortress.